Jeremiah 6:16 is the secret to true contentment. It's found in walking the ancient paths. In this world, we're told to run after so many things to find happiness but only when we go to God's Word can we discover lasting peace. This world is a rapidly changing place. There is no firmer foundation than the Scriptures - which remain unchanging. In this blog I explore how we apply God's eternal Word to the issues of today. Pursuit of Glory is an autobiographical collaborative work done with my Father. It discusses my growing up years in the country of South Sudan and his mission work in that place. 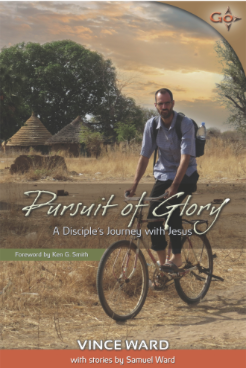 Praise for "The Pursuit of Glory" and "The Land Were the Cattle Roam"
If your only exposure to 21st century missions is what’s happening in the slickly civilized cities of the world, it may be time to expand your horizons. In Pursuit of Glory, Vince Ward takes you to the rough and tumble primitive surroundings of South Sudan—where over the last decade, with no electricity or running water, he’s helped a small team plant a dozen local churches, launch a radio station, and create an elementary school with 165 students. But this is really two books in one. Ward’s 15-year-old son Samuel writes the final 12 chapters, challenging comfy stateside readers to watch the growth of God’s kingdom through the eyes of a wonderfully perceptive boy. The interplay between father and son (not to mention a remarkable cobra-killing wife and mother) will stretch your thinking about the courage and commitment it still takes to be a missionary in some parts of the world.